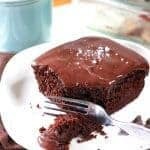 A delicious and easy to make chocolate cake your whole family will love, with an easy to make homemade ganache that's 100% foolproof! Spray an 8 x 8 pan or a 9 x 13 pan with non stick spray. In another microwave safe bowl heat cream until it just begins to boil. About 2 minutes. Pour over chocolate chips and let sit for 2-3 minutes. Using a wire whisk, mix well.Chocolate will melt and will become a creamy consistency. Add vanilla. Cool in fridge for 10-15 minutes before frosting cake.Note: If you are in a hurry to serve, I found that chilling the cake after frosting it, for 30 minutes helped set up the ganache.